We quote from the FoodSaver website "The FoodSaver® FM2000 Vacuum Sealing System keeps food fresh up to 5x longer and saves up to $2700 per year based on buying in bulk, on sale and preventing waste. Form and function combine with a sleek, compact design and easy-to-use manual operation to preserve a variety of foods." Use mason jars to make your breakfast meals, salads for a week, buy food in bulk and put in smaller FoodSaver bags or mason jars to store and save $$$$! Please share how you would use this awesome giveaway if your name is chosen as the winner. 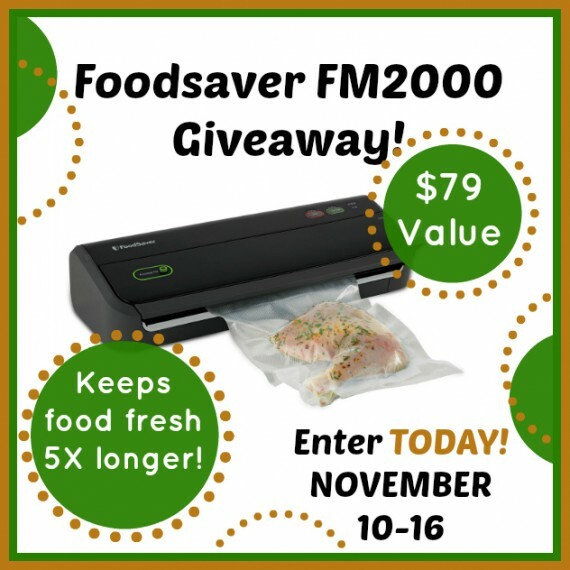 This FoodSaver® Vacuum Sealer FM2000 Giveaway is open to any resident who is 18 years of age or older who lives in one of the 48 US Contiguous States. This giveaway starts on Monday, Nov. 10th at 5:00 am (MST) and ends onSunday, Nov. 16th, 2014 at 5:00 pm (MST). The winner will be notified by email and will have 24 hours to respond. If we do not hear back from said winner in the designated time period of 24 hours we will choose another winner and they will have 24 hours to respond from the time the notification email is sent. Please check your SPAM email folders. Good luck to everyone! Let's be prepared for the unexpected!